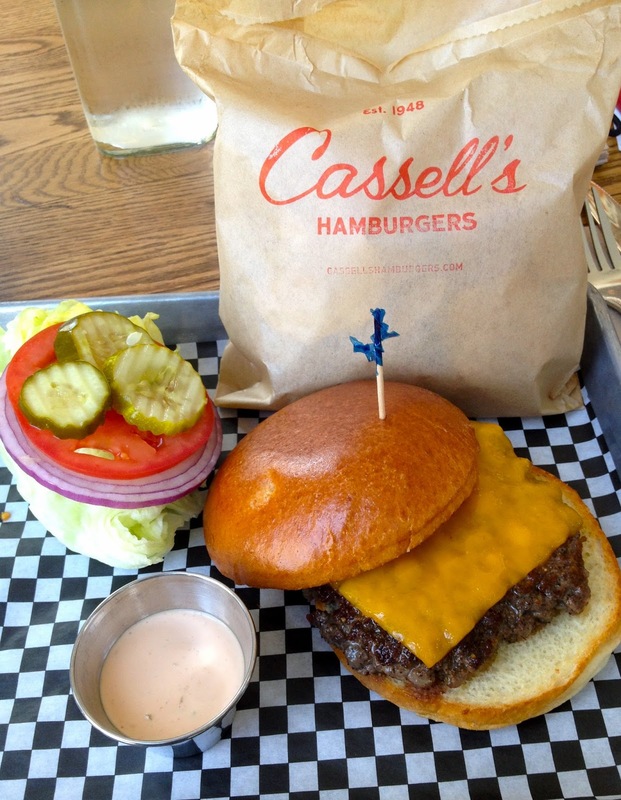 THE UNEMPLOYED EATER: I Can't Decide If I Like The New Cassell's Hamburgers. I Can't Decide If I Like The New Cassell's Hamburgers. Two things are for sure. One, I'm not a Cassell's Hamburgers purist. I'm not from Southern California originally and actually had never even heard of the joint until last year when word hit the street of a resurrection and locals began popping burger boners. I had no idea at one time Cassell's was considered the Southland's top burger. And two, it's been almost three weeks since I sampled the new Cassell's and I still have absolutely no idea if I liked it or not. I know that makes me a disgraceful food blogger. I can imagine you scratching your head and saying in a "Leave It To Beaver" voice apropos of Cassell's heyday, "Can't make up your mind? What are you an idiot? Did you like it or didn't ya?" The thing is I did like things about it, but... I also disliked things about it. Usually in such situations I return to the scene of the crime for a do-over. Unfortunately I just haven't been able to do so and felt I should share my indecision, so maybe you can make the trek to K-Town and make up your own mind? Let's start with the likes. The place is a serene burger eating haven. Nostalgia as all heck, it's beautifully situated on the Hotel Normandie ground floor's northern-most corner, at the intersection of W. 6th and Normandie in the heart of Koreatown. Encased in vast sidewalk level windows, I know of no more idyllic burger chowdown setting in town. 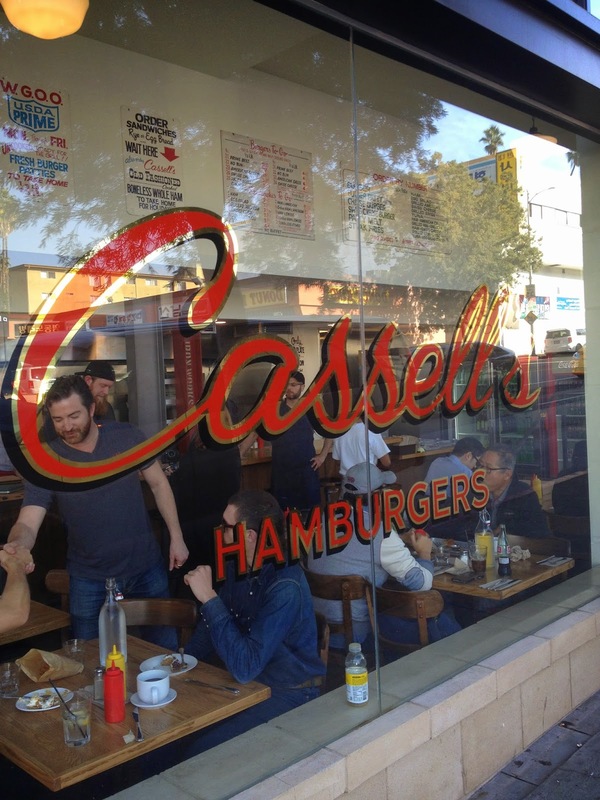 The new Cassell's expertly teeters the wistfulness of LA burgers yore with modernity like no other. It almost doesn't matter what food they're serving inside. It's the sort of restaurant you want to hang out in. Also good is the actual burger! Whew! Even the smaller size patty of prime, ground in house USDA beef (1/3 lb) appears and comes off as massive. I'm a big eater, but the "small" burger is plenty. The burger, although thick, is tasty, juicy and satisfying. The accoutrements -- iceberg lettuce, red onion, tomato and pickle -- are vividly fresh. The accompanying gratis chips also are solid. Salty and crunchy, they are a welcomed fry alternative. 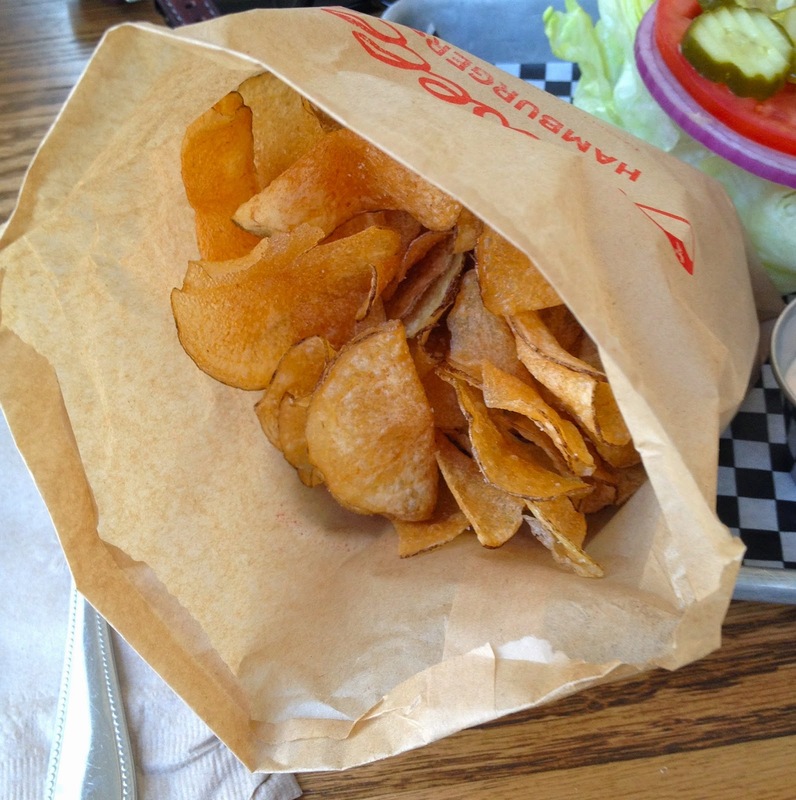 And like the main course, the chip bag is massive. You will not leave hungry. Now, on to the negatives... Although chances are you will not, in fact, leave hungry, I still would argue the place is way overpriced. From my research, I read the old Cassell's always priced itself above the competition, so the hefty pricetags were to be expected. However, that was a different time when the city wasn't chock full of a myriad of gourmet burger options. Cassell's WAS THE GOURMET BURGER. As delicious as it tastes today, that's no longer the case. This is a good burger, not a gourmet, top-shelf burger. Thus, it shouldn't cost $11.99 for a walk up and order 1/3 lb cheeseburger. Further, you shouldn't have to pay to park to eat said 1/3 lb burger. At lunchtime it's a reasonable $3 (I believe it's $6 at night), but if you add up my cheeseburger, my wife's cheeseburger and that parking fee, we're talking $30 for a good fast food burger lunch. That's with us drinking water. While it's cool they sell both their own sodas and Coke products, an 8 oz Diet Coke goes for a ridiculous $2.50. On another note, the burger, albeit delicious as aforementioned, is oversalted/seasoned. Whoever's manning the broiler needs to chill the heck out with the salt sprinkler. So... is the price and a slight overseasoning problem enough to doom a place? For me, the high bill of fare taints the entire Cassell's experience. I get that rent is no longer cheap in K-Town. I get it must have cost the hotel owners Scrooge McDuck money to overhaul the corner space into the bombshell it became. I get it's a massive restaurant serving from very early (they have a coffee bar and breakfast) to very late (and a full liquor bar) and there are many employees' rents to pay. Yet, the burger costs exactly one cent less than Plan Check's signature burger (albeit minus any side, but plus sitdown waiter service). I just am unsure it's worth such a pricetag. For now the new Cassell's will remain the "Homeland" of LA burger spots - I may never be able to decipher if it's good or not. 3600 W. 6th Street. KTown.